What do you do that makes you feel at home? For me working out is like breathing, it’s a major stress buster and I look forward to it every day. On weekdays after a hard day at work, I unwind at the gym starting with some stretching then I punch my way from the smallest punching bag progressing my way to the biggest bag. On weekends I try and spend more time at the gym adding some cardio and ab workouts. Occasionally I go for a swim or running outdoors as long as I am active. 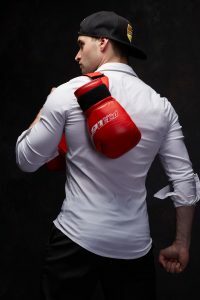 While working out on the punching bag, our brain provides a rush of endorphins, the neurotransmitters that create feel-good thoughts and a natural mood booster. Boxing encourages a healthier lifestyle, which benefits our mental & physical well-being, sleep patterns, eating habits, and self-care. Fitness boxing also works as a good aerobic workout which gets your heart pumping and helps lower the risk of high blood pressure, heart disease, stroke and diabetes. It can strengthen bones and muscles, burn more calories. By rhythmically practicing the movements and punch combinations I feel more focused, coordinated and graceful. Working out and gaining the right body posture boosts my confidence levels. Just like a strict parent at home, Alex, head coach at Golden Gloves Fitness, ensures that everyone is in discipline and has the right form while boxing. He personalizes everyone’s workout and helps you achieve your fitness goals. For these reasons I really love my time at the gym as it feels like my second home, sometimes I wished it was my profession to be associated to it full time. So why not get up & give boxing workout a try? Give us a call today or come by and visit us and see how life becomes much more meaningful and energetic. We're always looking forward to being in touch with you and stay tuned for more fitness/ boxing-related news, info and advise from Golden Gloves Fitness! Copyright © 2015 Golden Gloves Fitness Ltd.